Man, where does the time go? I’ve been meaning to write this for weeks! This summer I had two kinds of caterpillars that I fed and kept while they did their caterpillar thing and became what they become. If you’ve never done this, you might want to give it a try. 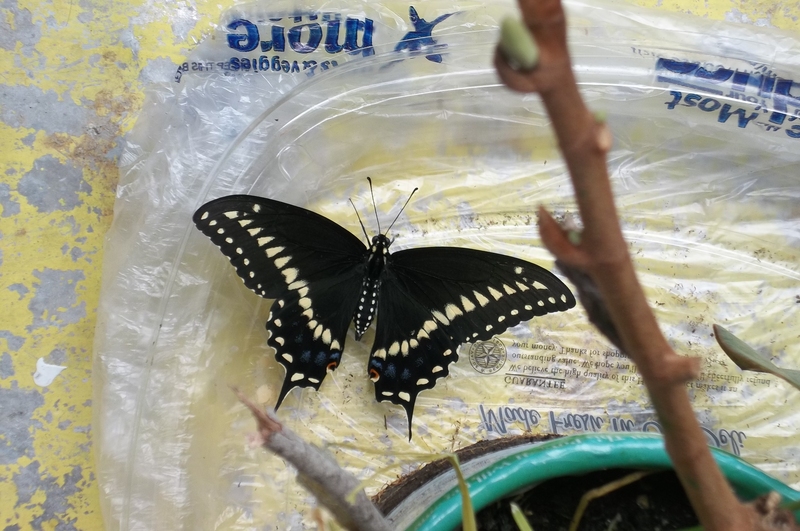 You can see what it feels like to be a midwife for our Lepidoptera friends. Hint: it’s fun. First, I’ll tell you about the day I went to the Big Box Hardware Store to check for marked down plants. It was the end of gardening season and that’s a good time to find things like parsley. Parsley lives for a whole year, so I like to get a plant every six months or so. Anyway, I found some parsley I wanted and when I took it to the register to see if the checker could mark it down, she and another employee were surprised that I wanted it. This plant was almost totally consumed and what was eating it was still there! Three swallowtail butterfly caterpillars were munching away. The plant was from a company that sets the prices and the store couldn’t mark it down, but that’s OK. I bought it anyway, because I wanted the caterpillars. This is made with window screen that I cut in a strip and sewed together and covered it with net. I did add more clothespins after losing caterpillars. The little jar and bottle had a bit of water and parsley in them. 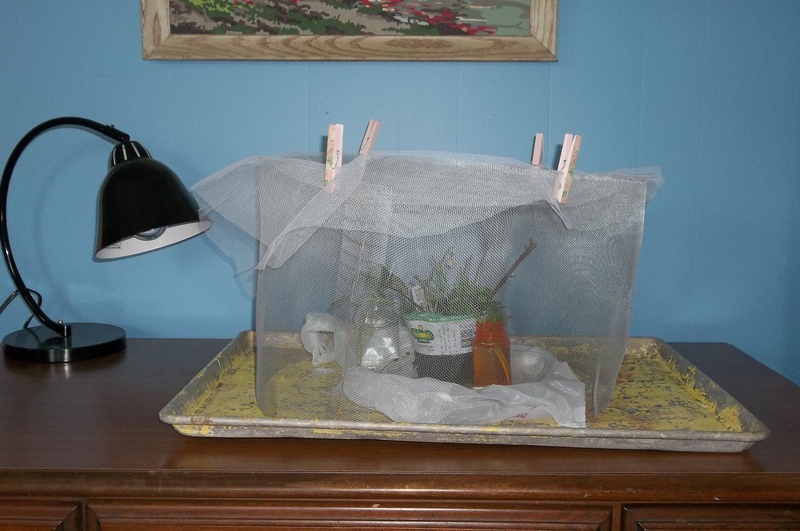 The tops should be small enough or else covered, so the caterpillars can’t fall in the water. Also, never, never, never feed them parsley that isn’t organic. I learned that the hard way once. They will die if they eat parsley that has been sprayed with insecticide. After seeing what happened to the caterpillars, I haven’t bought parsley that wasn’t organic, no matter who was going to eat it! What is funny to me about the one I lost is that I looked around the living room one morning to see if he was flitting about the room. It felt like it was time. An hour or two later, hubby told me he found my butterfly. It was in his study. We very carefully caught it inside the screen and netting and took him outside. The only photos I got were taken in the house. 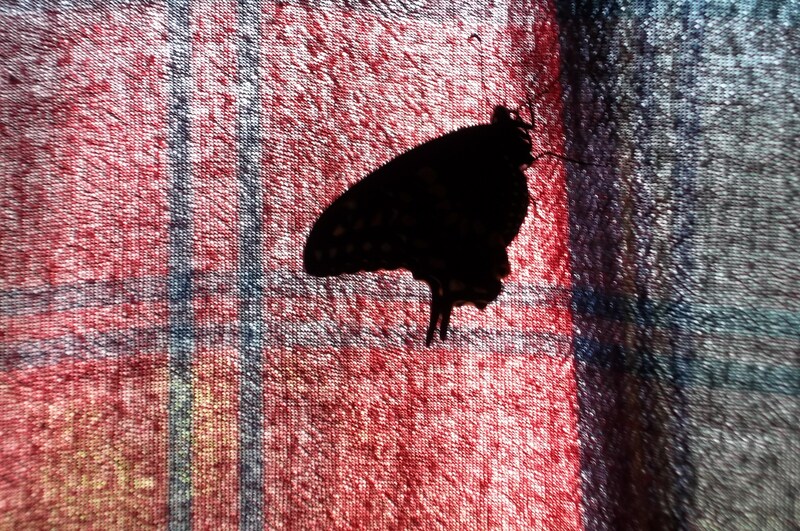 The butterfly who was lost. Something cool happened with the third one. One morning when I first got out of bed, I went in there to take a look at him. I’d never done that at that time of day, and there he was on the stick he’d chosen and he was moving his mouth from side to side. What on earth? Making his support, that’s what. In less than half an hour, they make the support that will hold them in place while their body goes through the changes. Boy, I sure was thankful to have been able to see this! I’ve raised a few butterflies and never caught that. When I wrote about butterflies a few years ago, I had no idea how they did this. You can check out videos of it on YouTube. It’s really awesome to see. Welcome to the butterfly life! There were also some other caterpillars in my yard that I don’t remember ever seeing. 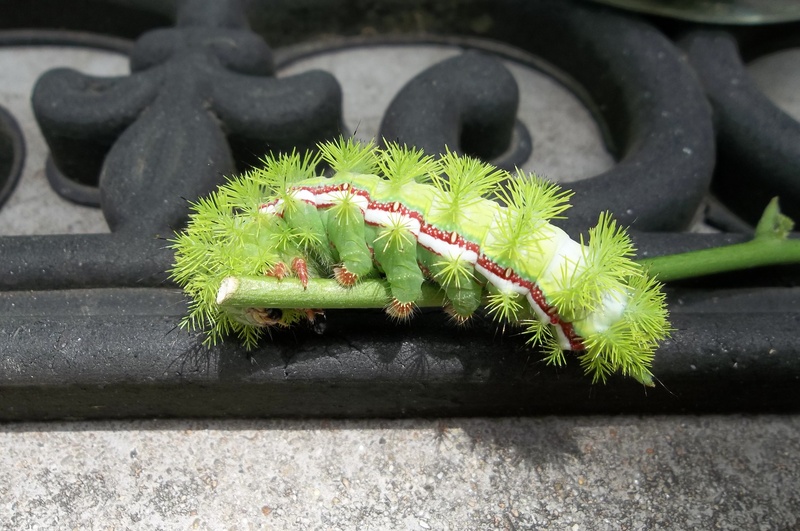 They are big and thick and green with a red and white stripe down their sides and they aren’t exactly fuzzy, but what they have on their bodies looks like bushes. Bushes? Yep. That’s what I thought, and so did my cousin when I showed him. We both thought this is one wild-looking critter. 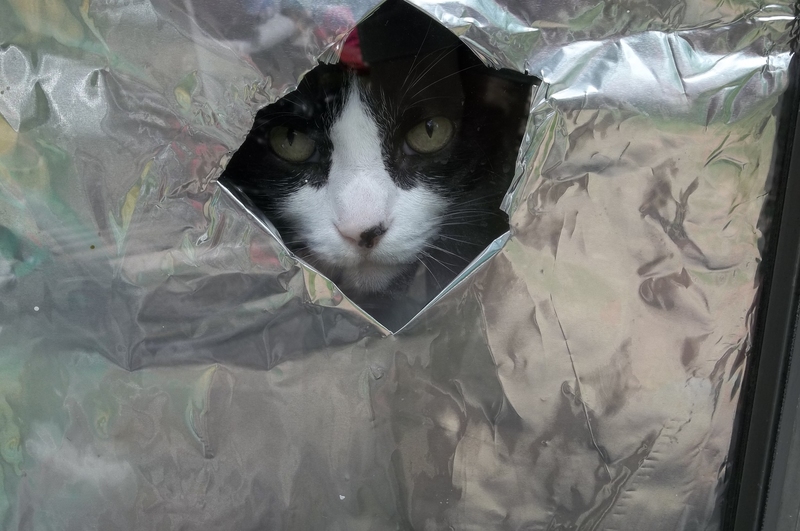 Just for fun, here’s my cat watching through the foil I put on the back door during the summer. I had to fix a peep-hole for him. So, I found him and put him in a jar, then found more. Before it was all over, I had seven of these fellows in a gallon jar. I fed them leaves every day. They have all made cocoons under the dirt and so far, two have come out and been set free. They are Io moths and boy, are they pretty! See the pretty ‘eyes’ on his lower wings? I’m sorry about the focus there. I have a cool little camera, but it focused on the wrong thing. The other five may overwinter in the jar and hatch out next year. I read online that they do that, and so was surprised when these first two didn’t. My guess is that the length of days signals them on what to do? So, those were some adventures with caterpillars this year. 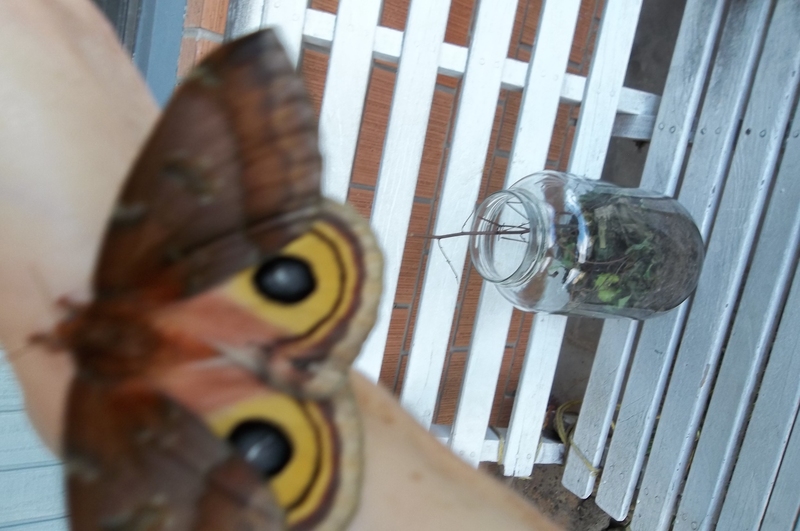 The jar with the five cocoons will spend the winter on the front porch where I can keep an eye on it, and the cocoons will be in their natural environment as far as light and temperatures. Yesterday, I put the caterpillar house up in the attic. Next year, along about early June it will time to take it down and go caterpillar hunting.